...Started playing as a band after Hurricane Katrina, in making a comeback for the city, they started playing almost every night in clubs on Frenchmen Street, New Orleans. The band is composed of musicians that have played together for years, and they created their own scene, becoming a great late night band to see in New Orleans...Playing old time finger picking guitar blues and an eclectic choice of material---original and traditional---that gets audiences dancing and having a good time. Available on CD "mail order" on this page (click “Add to Cart”). Also available on CD directly from Amazon, and as download from Amazon and iTunes. 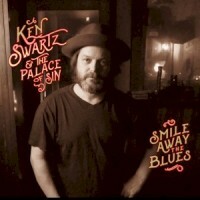 From the bouncy opening Reverend Gary Davis tune through a down-home reading of Crow Black Chicken, Ken Swartz’s deep love of blues and deeper love of his hometown are unmistakable on his third outing with the Palace of Sin. The title encapsulates that classic N’awlins spirit perfectly—especially fitting since this group began in the wake of Hurricane Katrina—and their variety of blues is the kind that leaves you feeling better. This band grew in the most natural Big Easy style. Swartz just went out at night and played, then joined some mates and kept playing some more; the ensemble’s longtime chemistry is palpable as a result. The leader’s plain crooning and nimble fingerpicking sit at the center while the cast adds harmonica, fiddle or lively sax whenever it feels right. It’s old-timey instrumentation suitable to some old-timey material: they pay homage to the likes of Sleepy John Estes, Washington Philips and Blind Lemon Jefferson with joy and respect. They’d rather capture a moment than polish ity—a twangy “Milk Cow Blues” was recorded away from any studio for one of the disc’s pleasantly rough-edged highlights. These tunes are well-performed and clearly well-loved. One can wish that Swartz got less carried away with homages and offered more of his own (only three tunes are originals here), but if you enjoy just soaking in the sounds and the atmosphere, that shouldn’t matter too much. It’s a rousing good time full of rye whiskey and Dixie grit. Also see Making “Old-Timey” New, a review by Dan Forte in Vintage Guitar magazine. 1. Sally Where Did You Get Your Liquor At?